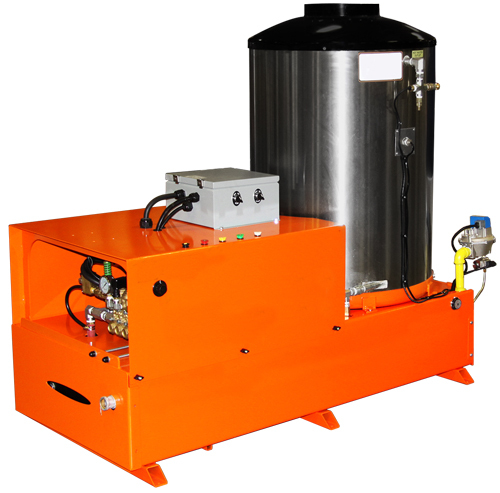 The BV stationary gas fired hot water pressure washer models provide high performance with modular design. They are available in either natural gas or liquid propane configurations to allow you to accommodate your individual needs. They are ideal for industrial and commercial cleaning applications. Our top-quality, durable construction models provide years of reliability. One of the greatest advantages of these machines is polyethylene float tank that allows an easy chemical application even under high pressure. BV series incorporates many exclusive features designed to save valuable time and money. One of them is an industrial rated belt drive triplex plunger pump that is the best money can buy in today's market. Additional features include 50' of pressurehose for continuous and uninterrupted operation, 4 spray tips (0°, 15°, 25°, 40° degree water spray disperse) interchangeable and practical for any power washing job, stainless steel control box cover, and a hi-rated trigger gun and wand for good grip and smooth maneuvering. These hot water pressure washer units come with the durable Baldor motors that represent top of the line motors in power washing industry. LH Series - 1000PSI-3000PSI LH Series incorporates a brand new generation and modern style of electric powered / diesel fired hot pressure washer. This series comes with the cart of your choice of either 4 pneumatic tires or 2 pneumatic tires and a rear support tine. All models are available as direct drive or belt drive machines. BV Series - 2500PSI-4000PSI The BV gasoline engine series are the most portable and maneuverable units in the industry. Versatility with features such as interchangeable wheel configurations allows you to accommodate your individual needs. The top-quality, durable construction provides years of reliability, dependability and low total cost of ownership.